Israeli soldiers shot and killed, on Tuesday evening, a Palestinian staff sergeant with the traffic police, after shooting him in the abdomen, and injured at least seven other Palestinians. 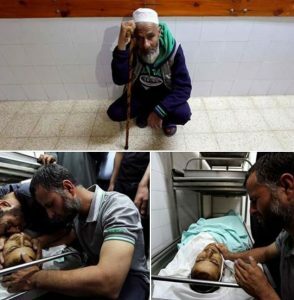 The Health Ministry in Gaza said the Palestinian, Fadi Ibrahim Najjar, 25, was shot with a live round in the abdomen, and died from his serious wounds. It added that the soldiers also shot another young man, moderately wounding him in the leg. The incident took place after the soldiers fired many live rounds at Palestinians protesting on their lands, close to the border fence, in Khuza’a town, east of Khan Younis, in the southern part of the coastal region. Furthermore, Israeli soldiers stationed on military towers around Nahal Oz base, across the border fence, east of Gaza city, fired many live rounds at dozens of Palestinians, wounding two in their legs. Medics rushed the two wounded young men to the Shifa Medical Center, suffering moderate injuries. Three other Palestinians were also shot with live Israeli army fire, east of Jabalia town, in the northern part of the Gaza Strip, after the soldiers attacked Palestinians marching close to the border fence. The three wounded Palestinians, who suffered moderate injuries, were rushed to the Indonesian hospital, in nearby Beit Lahia town. It is worth mentioning that the Israeli army constantly opens fire on Palestinian farmers and workers, in their own land close to the border fence, in addition to repeatedly attacking fishermen in Gaza territorial waters. 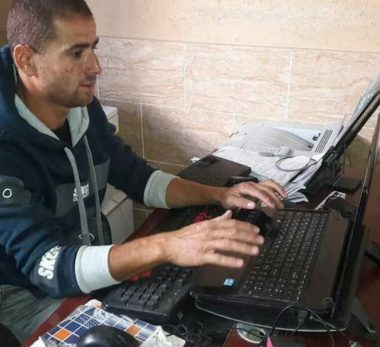 On Monday evening, May 15th 2017, a Palestinian fisherman, identified as Mohammad Majed Bakr, 25, was killed after Israeli navy ships opened fire on fishing boats, less than four nautical miles from the Gaza shore. In related news, Israeli police officers shot and killed, on the evening of Monday June 06, 2017, a young Palestinian man, indemnified as Mohammad Taha, 27, the police invaded Kafr Qassem town, east of Tel Aviv, and resorted to excessive use of force against the residents, amidst accusations that the police are not providing security to the Arab citizens of the country, facing increasing levels of organized crime, and violence.